Background: An improved jawline or support to the lower third of the face is most commonly done using implants. Standard chin and jaw angle implants have been available for three decades in a variety of styles and sizes. 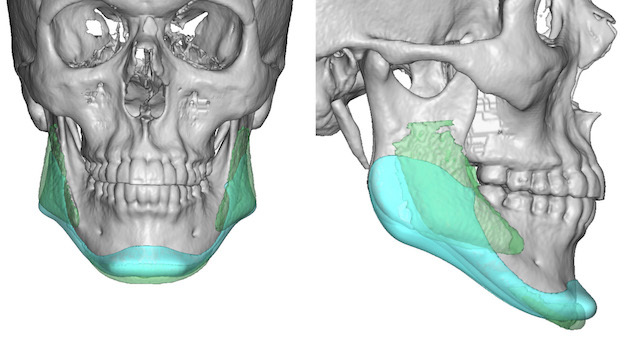 While effective for some patients an unconnected three implant jawline augmentation approach has potential issues of malpositions, lack of connectivity as well as inadequate aesthetic outcomes. The one-piece custom jawline implant has become the best method for total lower facial augmentation as it has a lower risk of malpositioning, is connected from angle to angle and offers greater preoperative dimensional control of the desired aesthetics. 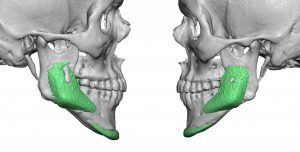 A significant percent of custom jawline implant patients have a prior history of chin and/or jaw angle implants. While they may not be ideally positioning or have the right dimensional characteristics, they are extremely helpful as they provide a known implant augmented effect. When you know what went wrong, so to speak, that serves as a guide as to how to do it better the next time. Case Study: This young male has a prior history of chin and jaw angle implants. The chin implant was a medium Conform and the jaw angles were of a 10mm widening style. 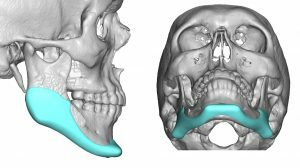 Besides the chin implant having not enough horizontal augmentation, the jaw angle implants were severely malpositioned being too far anterior and superior along the external oblique ridge line. Using the 3D CT scan and the size and position of the existing implants, a custom jawline implant was designed to overcome their existing inadequacies. Digitally overlaying the new implant design over the existing implants shows their differences and presumed improved aesthetic outcome. 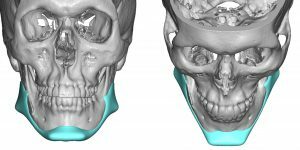 Under general anesthesia the existing chin and jaw angles implants were removed. 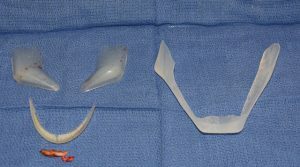 When laid next to the jawline implant to be inserted, the differences could be appreciated visually. When placing a custom jawline implant after removal of chin and jaw angle implants it is much harder than if no implants were ever present. Scar tissue on the bone must removed (capsulectomies), scar tissue must be broken through to expand the boundaries of the old implants as well as make a complete connection and bony overgrowths must be removed to allow the new implant to sit properly. 1) Standard chin and jaw angle implants do not work well for everyone in creating the desired total jawline look. 2) A custom jawline implant ‘learns’ from the indwelling chin and jaw angle implants to create an improved and connected jawline augmentation. 3) Removal of existing chin and jaw angle implants for the placement of a custom jawline implant requires capsulectomies and capsulotomies well as bone removal.